In the 4th edition, we have a newcomer Shinmai who will become Minarai's new colleague. 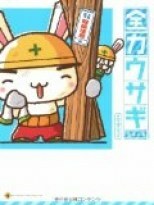 The owner of "Give-it-all-out Construction Inc.", the Grandpa Rabbit, asked Minarai to be Shinmai's instructor. However, Shinmai is very shy and it seems that he has some facts that he wishes to hide. Minarai who is doing his best to approach Shinmai faces his new challenges. ZU rabbits with vivid personalities make the story a little bit cruel, but at the same time full of sentiment and happiness. This time, Minarai is willing to support his ZU partners wholeheartedly just like what they did to him before. He wants his ZU partners to feel the happiness that he has gotten from them in the past. Although he can only accomplish very little thing at the moment, he expects himself to keep giving it all he's got continuously. If there is any reason for this, that is, when all the people around him could maintain the smiles as always, he could feel the happiness himself.